Massive amounts of misinformation, disinformation and Islamophobia provided by the religious and secular media. The mistaken belief that Islam is a monolithic religion in which its followers all hold identical beliefs and behave in the same way. The assumption that the beliefs and actions of a small radical, fundamentalist, violent minority within Islam is typical of all Muslims everywhere. The often repeated but mistaken belief that moderate Muslims never criticize religiously inspired hatred, violence, terrorism, injustice, etc. in their midst. Video: "Inside Islam: What a billion Muslims really think:"
This one hour video was produced by Unity Productions Foundation. It is based upon a massive study by the Gallup Organization -- the most extensive public opinion poll ever taken of the Muslim world. Gallup interviewed tens of thousands of Muslims in 35 predominately Muslim countries and among Muslim populations in Europe and the U.S.
"Religion the mother of all hate and loathing,the father of festering greed, the birth of power over humans. Religions and the people who follow them disgust me, hanging torturing burning greed separatists elitist hate fueled monsters." IMHO, these comments form the best possible demonstration of the need for the ReligiousTolerance.org website and similar websites and groups promoting tolerance. "The Truth about Islam" has been called the "best, short introduction to Islam" and has been published in Foreign Affairs, The Brown Journal of World Affairs, Washington Report On Middle East Affairs, Teacher Magazine, The Washington Times, Islamic Horizons, etc. It was displayed in the Washington Metrorail system in 1998. Thousands of posters and flyers have been distributed containing the text. It can be obtained in the form of a bronze plaque, 4x9 rack cards, 5x7 iCards, or flyer. 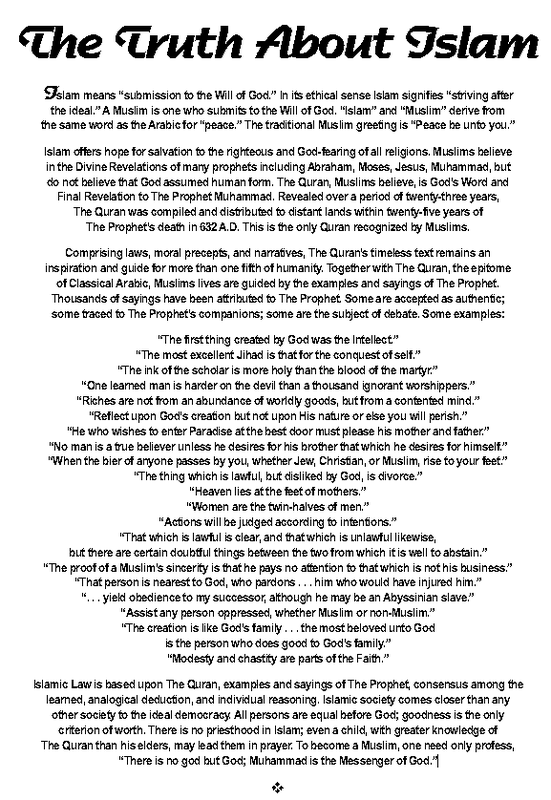 "The Truth about Islam," by The Wisdom Fund, at: http://www.twf.org/ as downloaded at 2003-MAY-31.